He was also fond of art, an enthusiasm his parents encouraged. Schenck’s ancestors included two noted Texas painters, Hermann Lungkwitz and Richard Petri, who were held in high esteem in his home. “So I was sent to a painting school when I was a teenager. 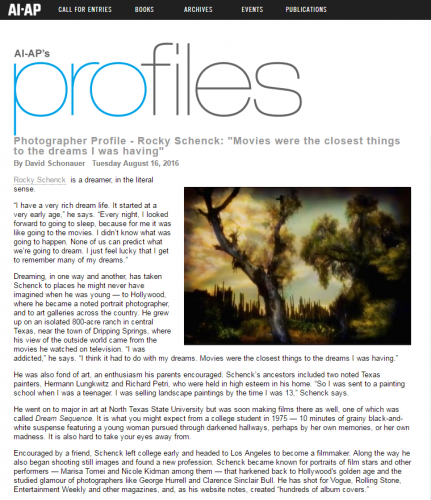 I was selling landscape paintings by the time I was 13,” Schenck says. He went on to major in art at North Texas State University but was soon making films there as well, one of which was called Dream Sequence. It is what you might expect from a college student in 1975 — 10 minutes of grainy black-and-white suspense featuring a young woman pursued through darkened hallways, perhaps by her own memories, or her own madness. It is also hard to take your eyes away from.